I received this grill from Coyote for review. As always, all opinions are entirely my own. I never thought I’d be grilling in November, but I am. That’s because I’ve been playing with our new Coyote Asado Smoker and it’s heavy ceramic construction makes it perfect for cold weather – it traps and maintains heat at a steady temperature like nothing else. Simply bring it up to temperature, shut the lid, and it stays at temp until the meat is ready. That’s the Asado in a nutshell. But let’s take a closer look. 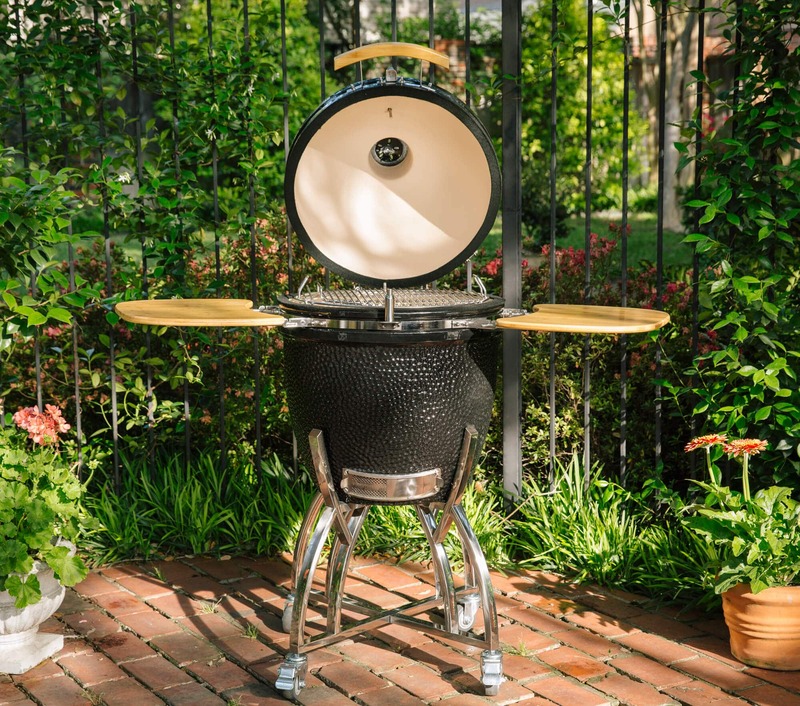 First of all, what is a kamado-style grill? It’s a modern version of clay vessels archeologists have found dating back 4000 years. These vessels also surfaced in Japan around 300 BC where they were called kamados – large round clay pots with removable domed lids. 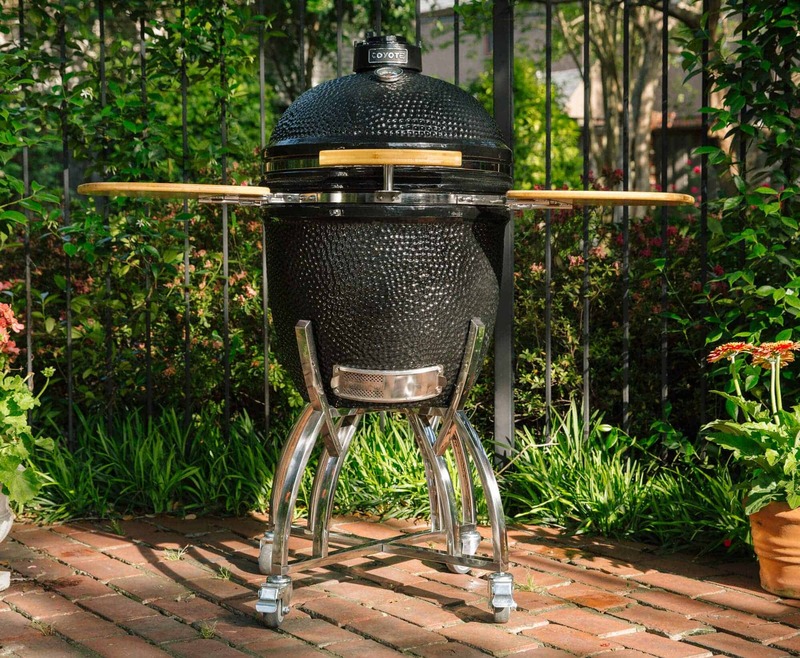 Kamado-style grills, like the Coyote Asado, enjoy the same advantages as their early ancestors: The ceramic construction does a superb job radiating heat effectively, retaining heat and keeping temperatures consistent. Like brick ovens, they absorb heat and radiate it back making them ideal for smoking, roasting and also making things like pizzas, breads, pies and cookies. They’re perfect for low and slow cooking but can also be cranked up to super high temperatures for searing. I’m looking forward to using my Coyote Asado for paella and tandoori cooking! A limited lifetime warranty on all ceramic parts, a 5-year warranty on all metal and cast iron parts, and a 1-year warranty for all wood parts, the thermometer and caster wheels. I had already admired the appearance of the Asado when I first saw pictures of it online. But seeing it in person was something else. First of all, the Asado’s appearance alone commands respect. I mean, look at it. You can tell this thing means serious business. Very well constructed, this thing is one tough and heavy beast weighing over 250 pounds! Fortunately it has strong locking casters to keep it from rolling away. Secondly, it’s drop-dead gorgeous with its dark, shiny color, stainless steel legs, and beautiful wood drop-down shelves. It’s a conversation piece and will win the admiration and envy of your guests. Assembly is minimal. The lid already comes attached so the only assembly required is to screw on the legs and shelves which takes all of 10 minutes. 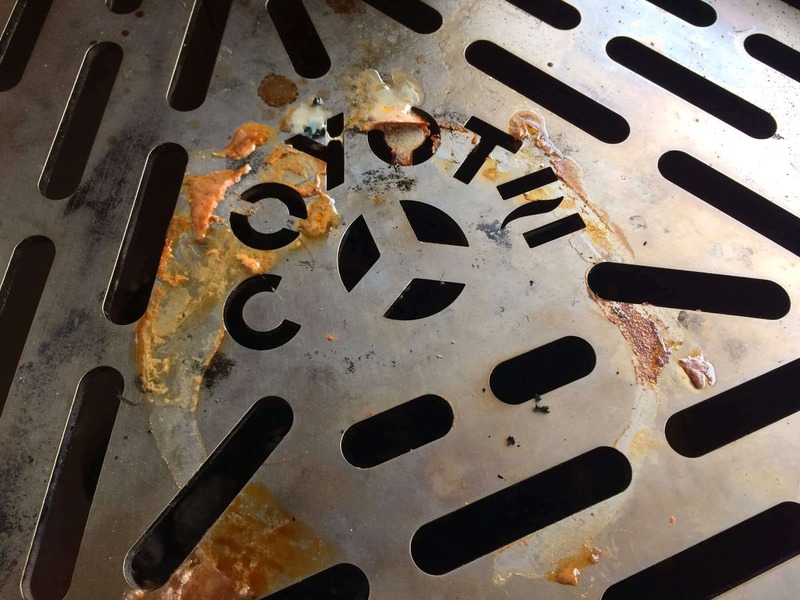 The Coyote signature smoking grate serves the purpose of diffusing heat by allowing the heat to pass evenly through the holes, thus preventing “hot spots” (where the coals burn hotter in some places than others). The cooking grate is placed on top. It’s diamond laser cut for making great sear lines on your steaks. Underneath the these two grates is the ceramic bowl insert where you place the coals. That’s housed inside the larger ceramic barrel. Thick felt pads line the rim so you can shut the heavy lid softly without cracking the ceramic. The Asado comes with two solid bamboo side shelves that easily fold down for storage when the Asado’s not in use. The wood is beautiful and their smooth surface makes them very easy to clean. 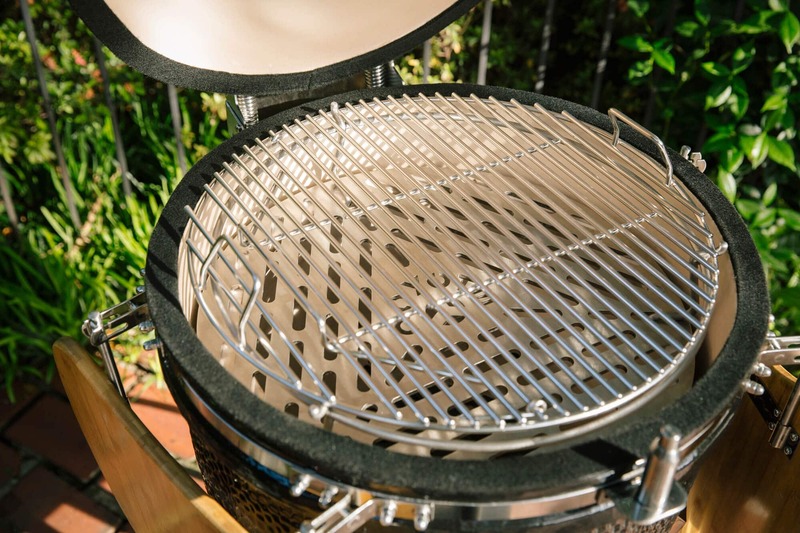 At the base of the ceramic grill is an air intake with a sliding screen that allows you to control the amount of airflow while also keeping the ashes from falling out. It also has a vent on the very top of the grill that allows you to open or shut it all the way or just slide it partially open. My first trial run with the Asado was smoking some ribs. I prepped the coals and then went inside to get the ribs ready. I rubbed them down with a homemade spice blend. The flavor was outstanding. 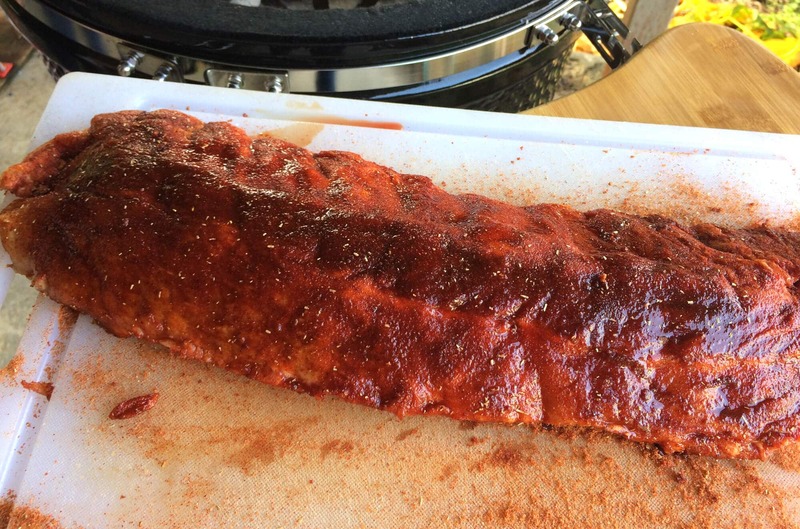 I threw a few woodchips over the hot coals to further infuse the meat with flavor and slathered the ribs down with some barbecue sauce. They were finger-lickin’ good! A couple of days later I smoked a whole chicken. I rubbed it down with a homemade seasoning blend and also used another gadget I’ll show you in a moment. The metal funnel below is the Coyote Chicken Throne. 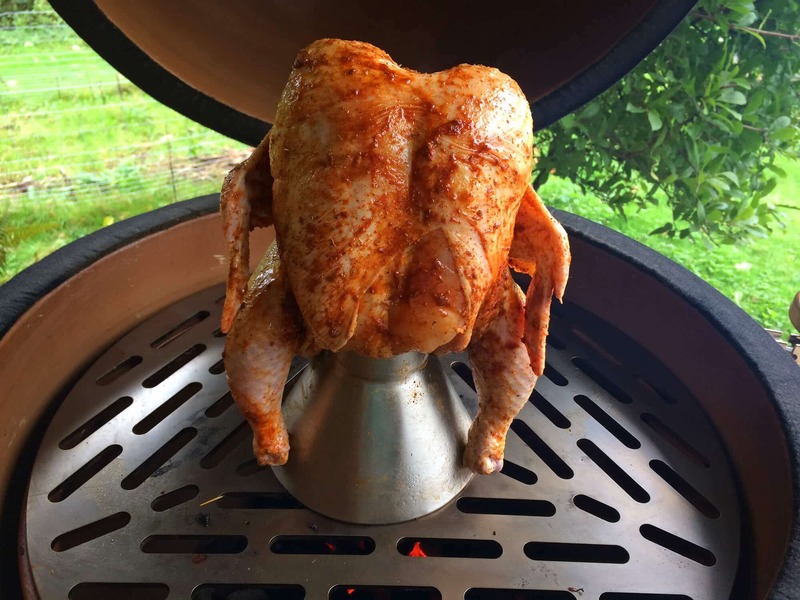 The old method of plopping the chicken on a beer can has just been upped several notches. This stainless steel throne is heavy duty and won’t break or bend if dropped. 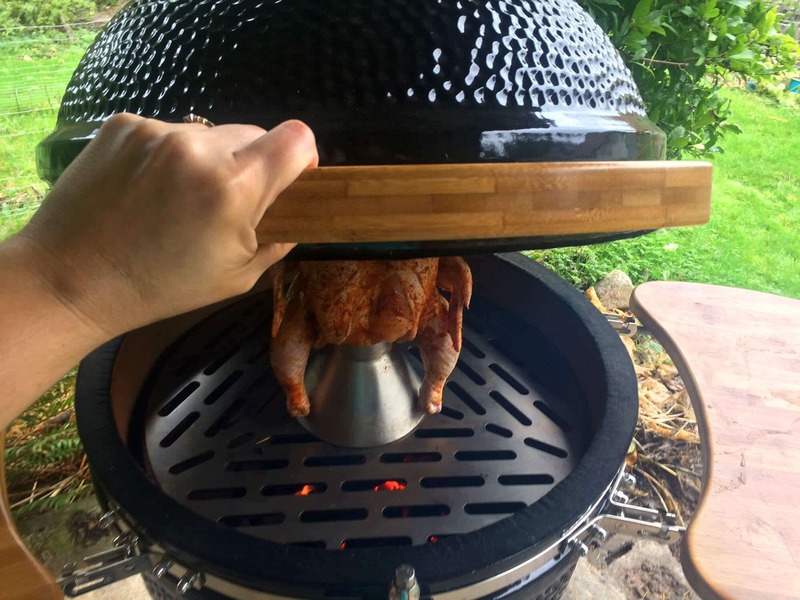 Its flared bottom also provides stability so your chicken won’t fall over while cooking. You fill the throne with herbs and liquid of your choice (wine, beer, etc. ), set the chicken on it and the throne will baste the chicken from the inside, infusing it with flavor and moisture. 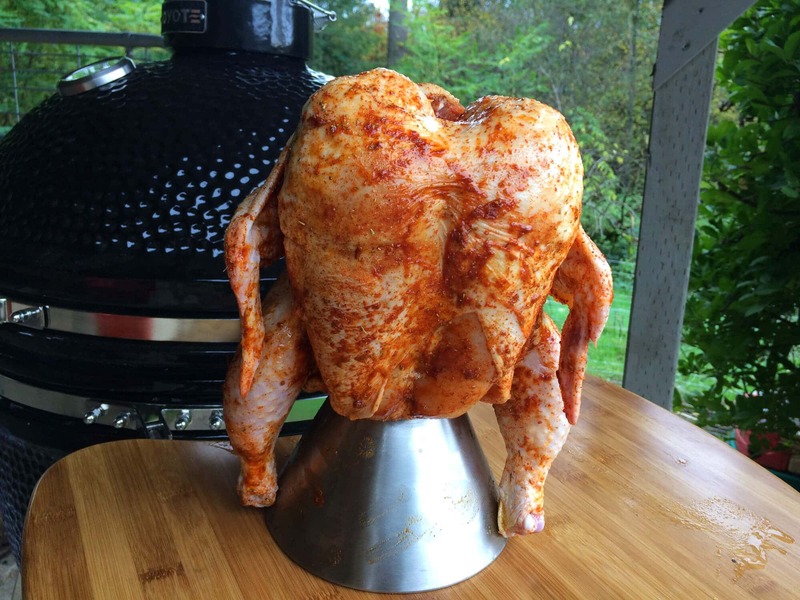 Plop the chicken upside down on the throne as you would if you were using a regular beer can. We got the temperature up to about 300 and set the bird in the smoker. 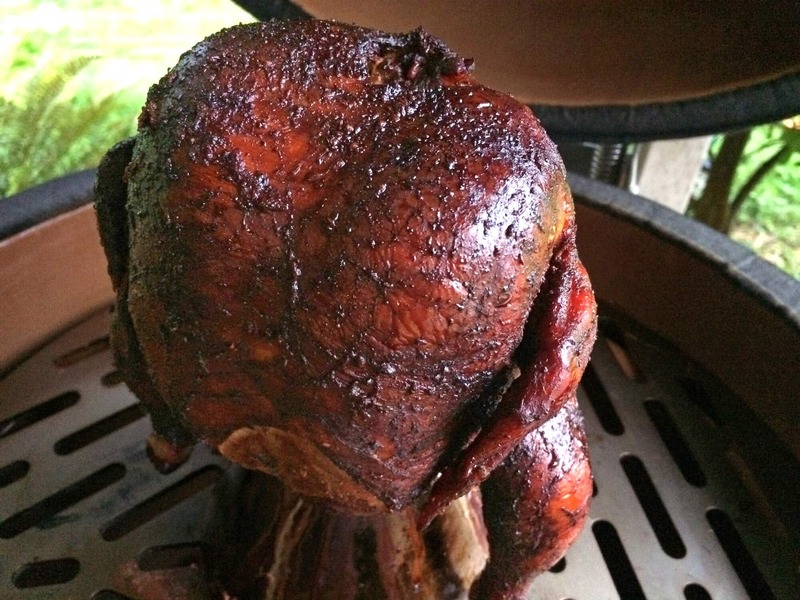 Look at that perfectly smoked bird! 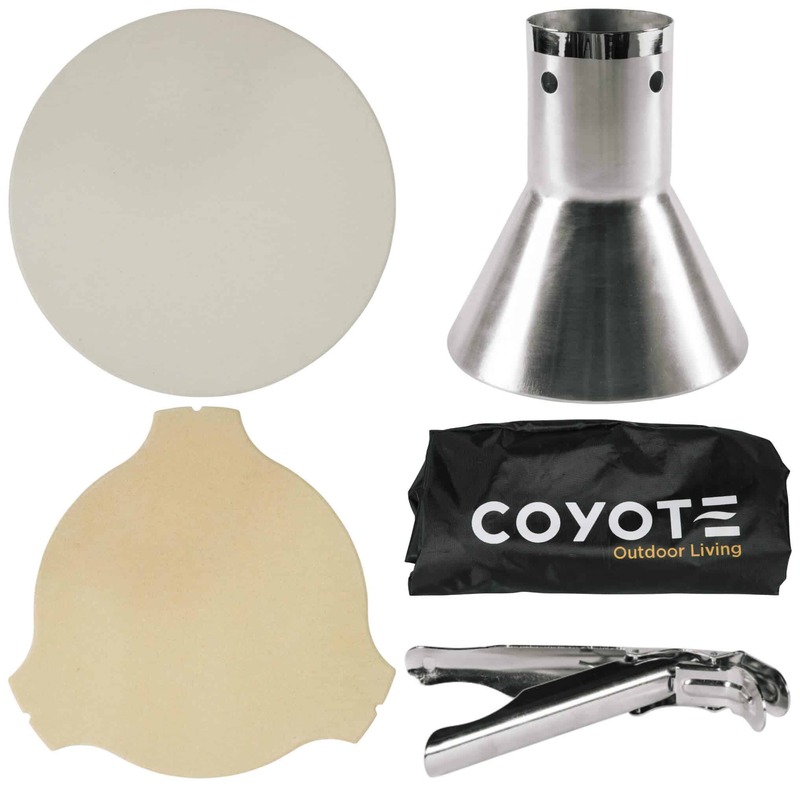 Additional accessories for the Coyote Asado that I’m looking forward to experimenting with are the 15-inch Pizza Stone and the Ceramic Heat Deflector. The pizza stone is made of heat-resistant ceramic (ie, it won’t crack from temperature shock) which ensures an evenly baked pizza crust. I’m going to grill some bread on it as well. 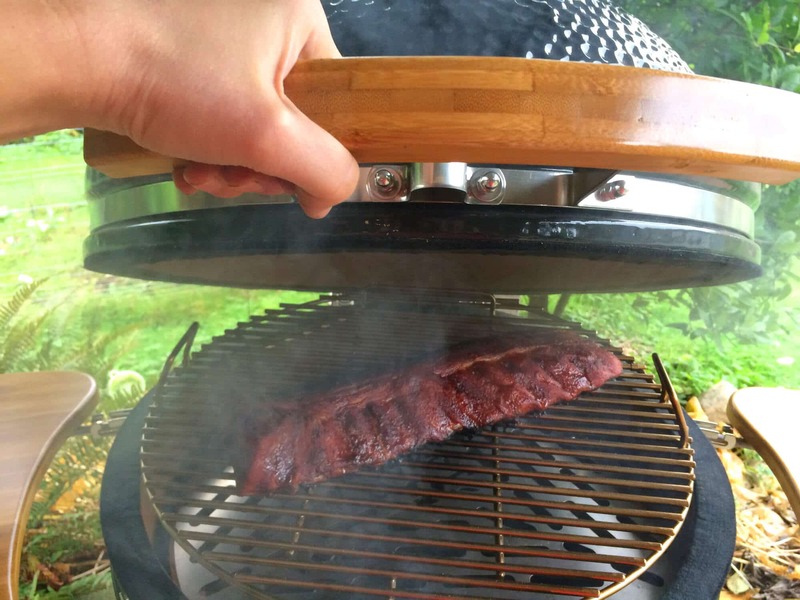 The ceramic heat deflector reflects the heat to capture the flavor of the food. 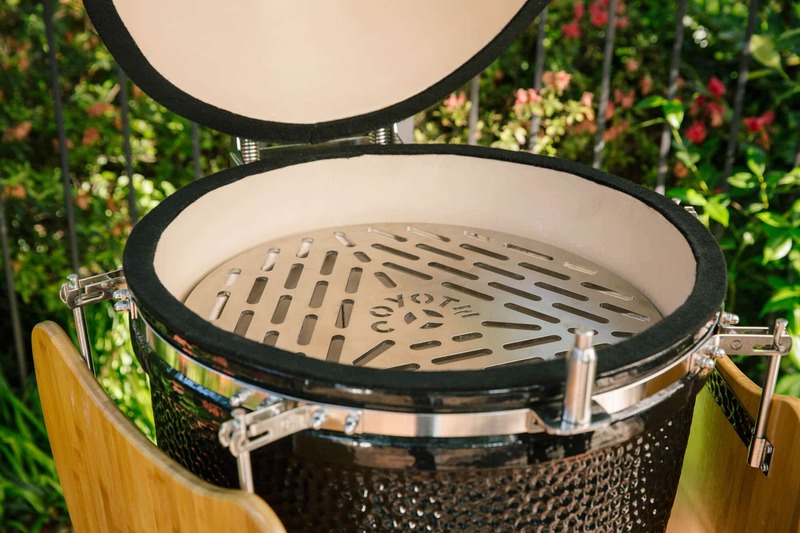 Also available is their custom grill cover (which we definitely need here in rainy western WA) and the Grid Grippers which makes it easy to safely handle the hot cooking grates. Bottom line: For the person who is passionate about grilling and fully dedicated to the art, the Asado is the perfect addition to your cooking lineup. As with all charcoal grilling, this comes with a learning curve. Lighting the coal, waiting for the fire to burn down and getting the temperature set is the easy part; getting the hang of gauging how much fuel you’ll need and how to properly regulate the airflow is what will require some time and patience. I’m still learning the ropes. But that dedication to “serious” grilling pays off: Truly, does anything taste better than fork-tender meat smoked over charcoal? No way. Properly taken care of, the Coyote Asado appears to be built to provide a lifetime of swoon-worthy food. 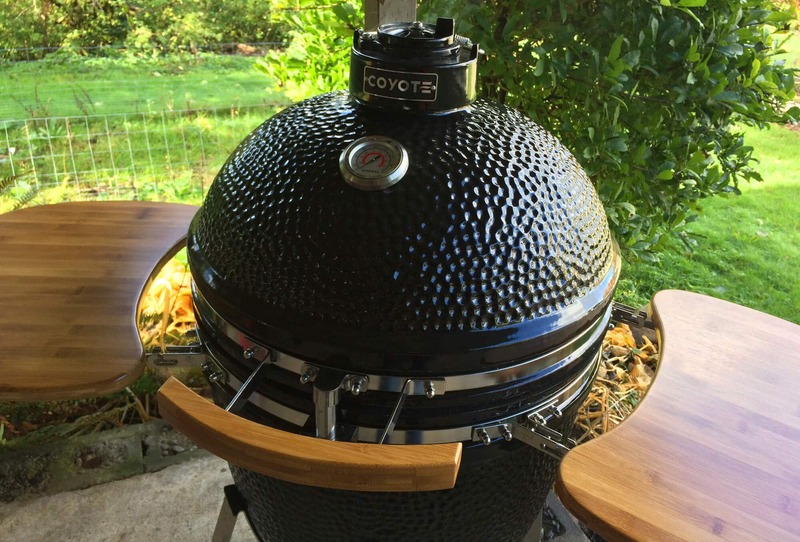 For more information about Coyote and the Asado Ceramic Smoker, visit Coyote Outdoor Living. 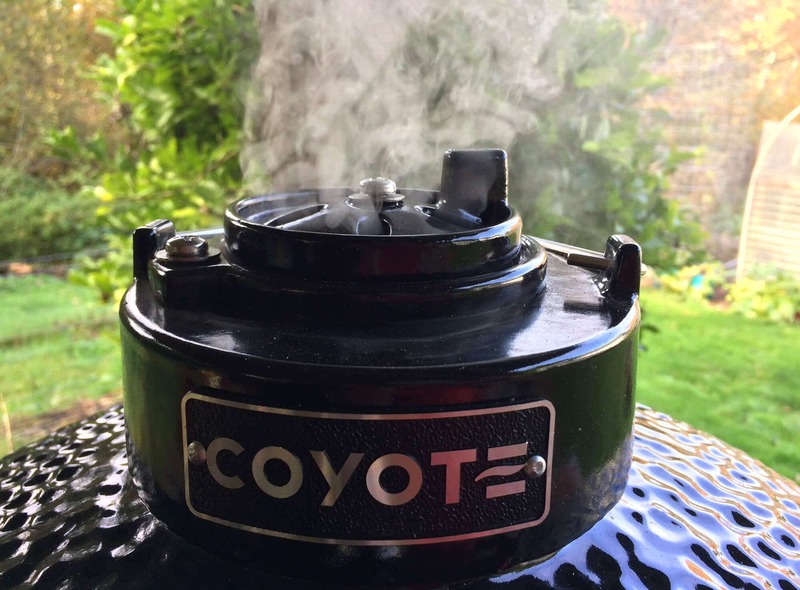 I was provided with a Coyote Asado Smoker to review. All opinions are entirely my own. I so appreciate this review, we’ve been looking at a couple of different smokers. Most are so large and I like the compact size of this one. Living in California we grill year round – I’ll be delving even deeper now into this product!! That is a seriously beautiful smoker. The food that came out of it looked amazing, too! Oh wow! 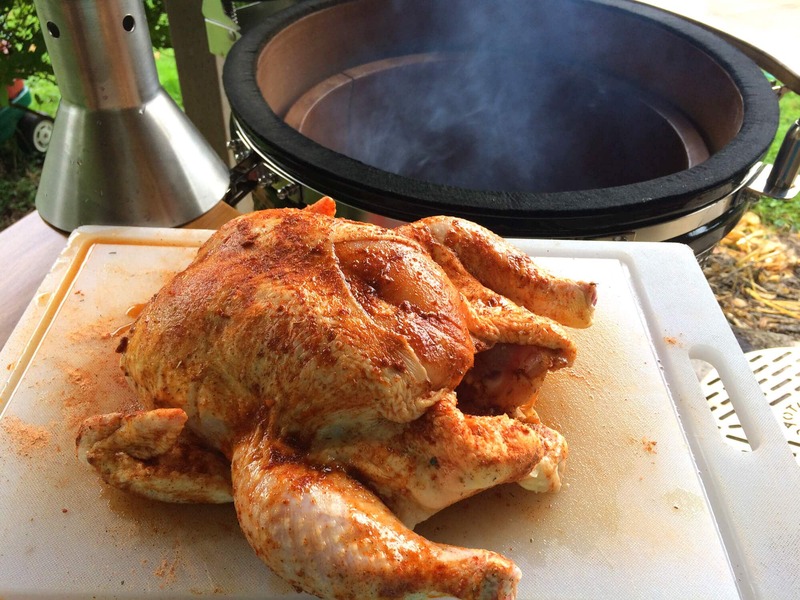 I’m sold on that smoker after seeing that chicken!! It sounds wonderful! I think Santa needs to bring this smoker for my Hubby. He will love it! My hubby would love one of these! 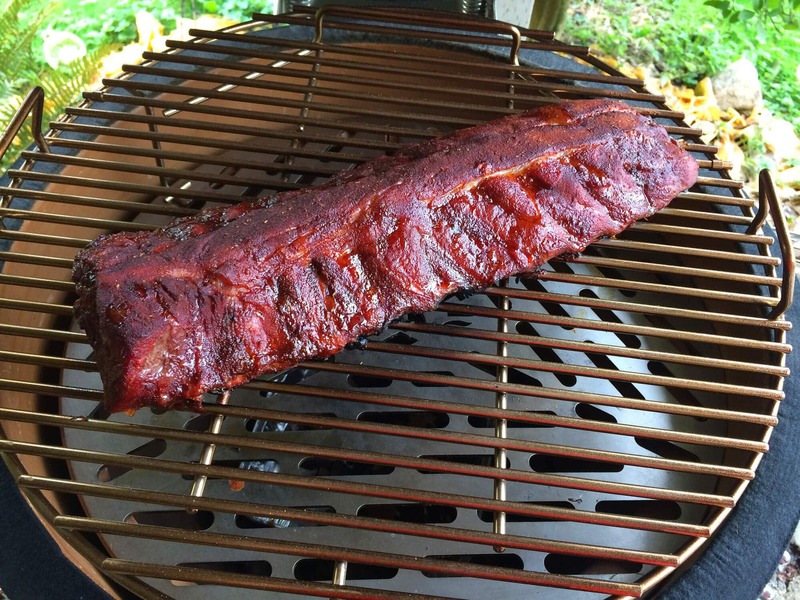 What a beautiful smoker…I admit I am jealous!! I am a big grilling fan now I want a Coyote asado smoker. I need to write my letter to Santa soon. That chicken and the rack of ribs look amazing! Is it weird that my first thought is, “Wow is this pretty!” I’ve never used a smoker, but would like to try! Wow, Kimberley. That’s a beautiful work of art to cook on. I love smoking meat, however I’m still a novice. I do like all the different styles of smokers, but this one is a show piece….I want one! Thanks for the detailed photos and review. That smoker is amazing! 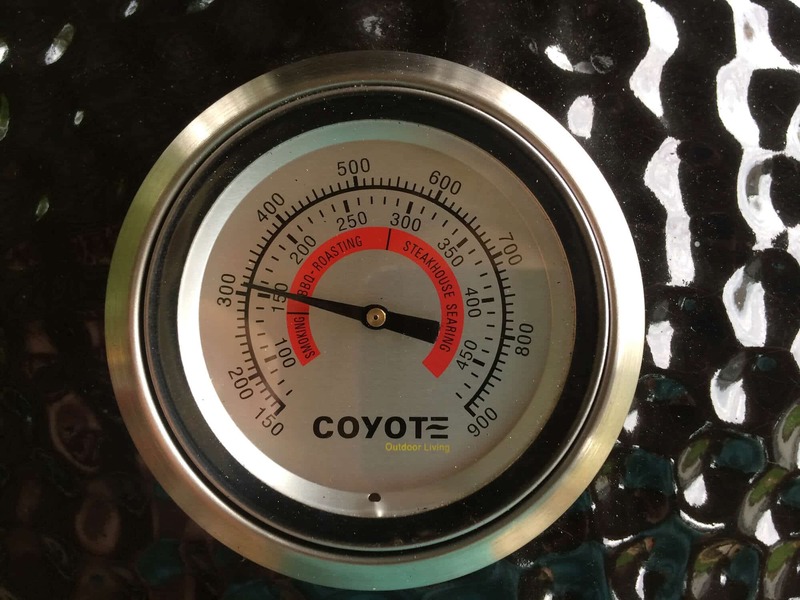 We have a Coyote Grill and LOVE IT! I can’t recommend Coyote enough – super high quality. Have you found a trick to keep you grates looking clean? If so, I’d love to hear it! Oh my… I wish I have one too! I love anything smoked especially fish! great review Kim. This is so awesome!! My hubby will love it! I need to look into this. We grill year round, and the food looks amazing! That is ONE serious grill! We grill year-round here in Texas so I’ll have to look into this model, thank you for sharing. I’ve always wanted a smoker, this one sounds pretty awesome. And oh my gosh, I want that turkey! Okay, that chicken throne is down right genius! 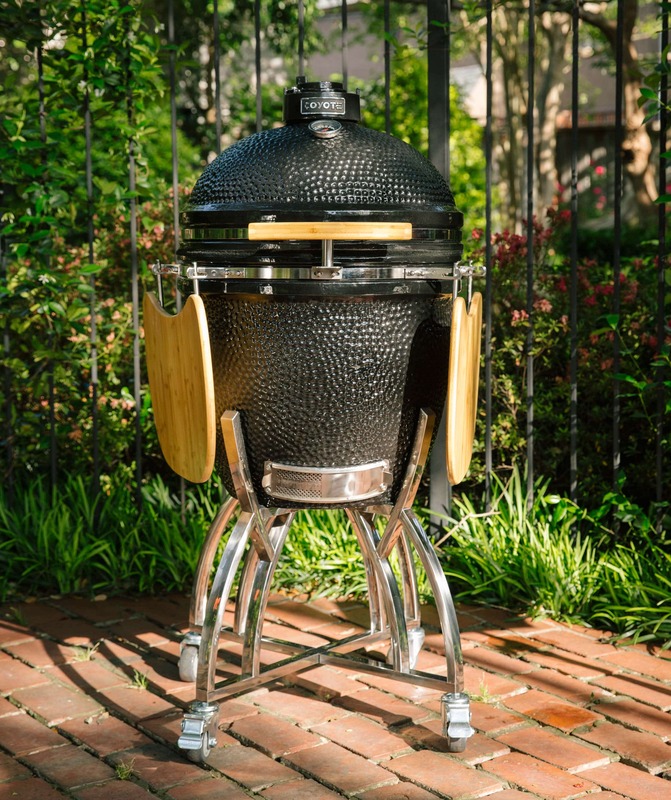 I’ve been trying to decide if I should spring for a smoker or not….this one looks like a winner! This looks amazing. I need to get a smoker this spring and I’ll definitely keep this one in mind. Great review! 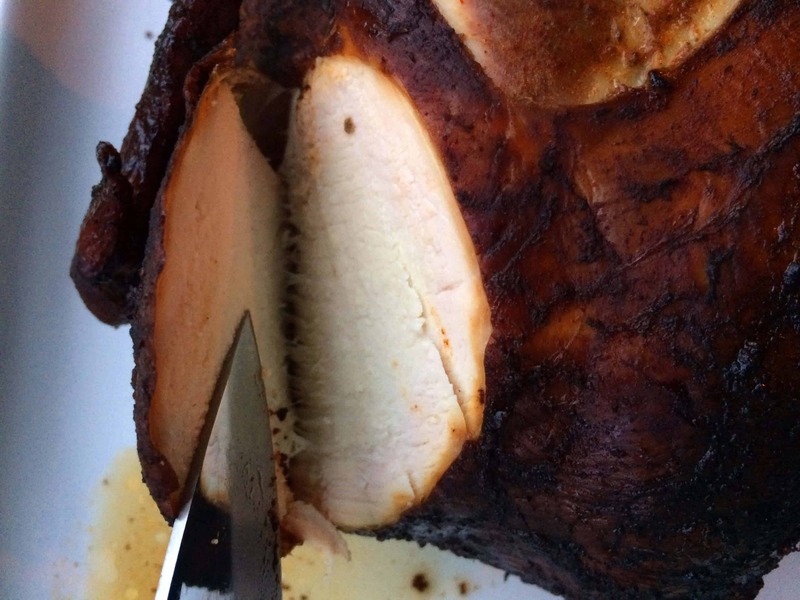 I got my Coyote Asado as a present a week before Thanksgiving 2016, and used it to smoke a 14-pound turkey, It turned out insanely well, and you could wring the moisture out of the perfectly smoked and cooked meat. I brined it for 14 hours, then seasoned it, then injected it with melted butter and garlic powder before putting it on the Asado at 300 degrees. BTW, BGE charcoal is good, but I’m hooked on Rockwood Charcoal. It is made in Missouri from Oak, Hickory and Maple. I also put a few chunks of cherry wood in the charcoal, for extra smoke. Wow, that does sound insanely good, Michael, thanks for sharing! Thanks also for the charcoal tip, I’ll look into it. Showing this to the hubby. 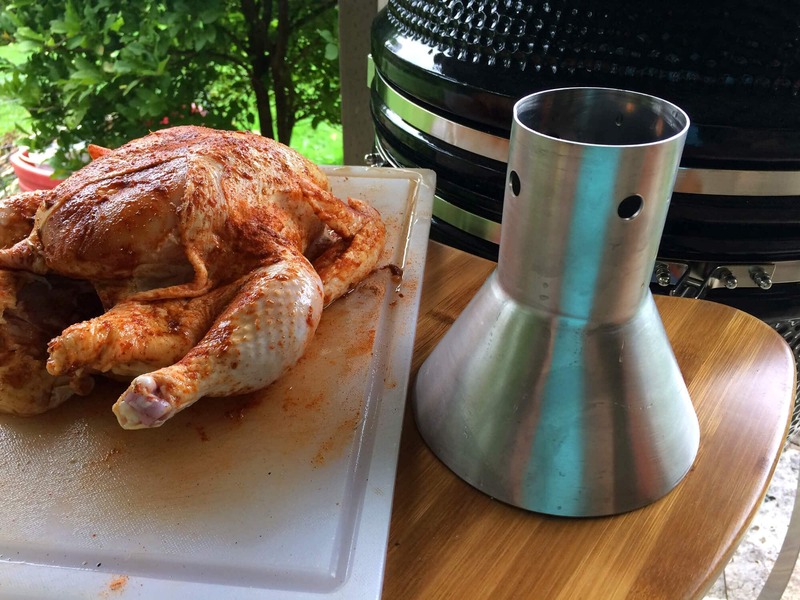 We’ve been looking at getting a smoker! 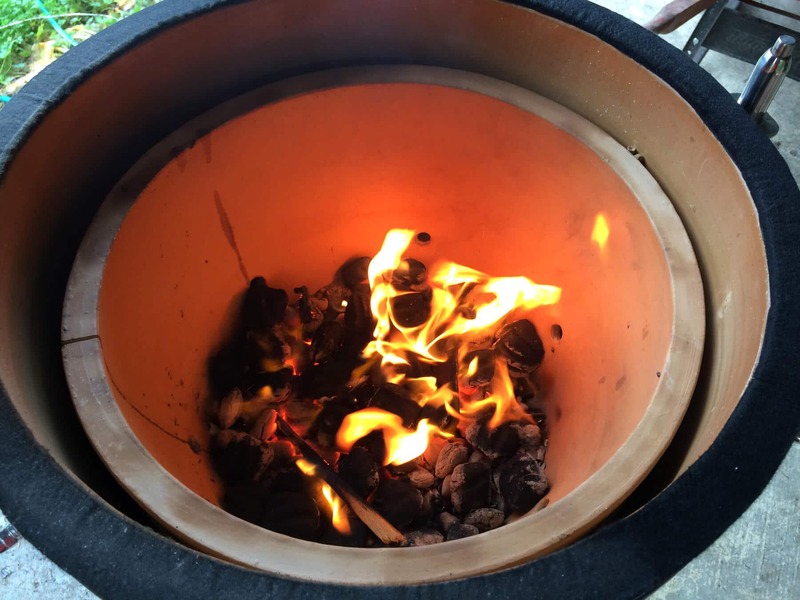 Why the use of briquette rather than lump charcoal? That is a no no with ceramic smokers. Hi Jon, I have gas grill, charcoal grill, electric smoker and a ceramic smoker and I generally do use lump charcoal for the latter.